I do believe that 2011 completely changed how I chose to live – less consumerism and baby steps towards self-sustainability was where my heart was. It really started because I wanted to avoid all processed foods and the nasty ingredients that they all contain: GMO’s, high fructose corn syrup, MSG, and hydrogenated oils. I also wanted to eliminate chemicals in our cleaning products and personal care items. Now, reflecting back I see just how much I actually changed. The garden was not much to brag about. I had good intentions but the turkeys benefitted the most. Another one of those ‘live & learn’ moments. (One needs to securely fence the garden) Lets just say, they ate really well! Raw Milk – Nothing compares to raw milk or the healthiest nutrition for your body. Grass-Fed Beef – in total this past year we purchased 3/4 of a cow. It was a commitment financially, but overall it is a per pound savings. Especially for the quality and health benefits. Home raised: Turkeys – this was an experience and we will definitely raise more this year. After an unpleasant ‘store bought’ turkey for our 2010 Christmas dinner, we made the decision to raise our own. Fed totally organic feed and allowed to free range our back yard, they were absolutely the best turkey we have ever eaten. They weren’t injected with salt water or ever given antibiotics. We did get many comments about how could we eat our ‘pets’! They were fun to watch grow up, but it was always with the intention of what their fate was to be. Eggs – Not a new change but noteworthy. We have had eggs from our own backyard for over 3 years now and I just can’t go back to store bought, anemic eggs. Once you have ‘free range’ , ‘cage free’ eggs you don’t realize just how bad the store bought eggs are. Other notable changes I made was to make homemade versions of what I used to buy. Salad Dressings: Vinaigrettes with my chive vinegar, Blue Cheese, Ranch, Thousand, Caesar…..you name it, I made it. Household Cleaning – you can make cleaning supplies for pennies and they won’t be harmful to you or the environment. Personal Care – It is amazing how much you can save by making simple daily use items and many from ingredients from the kitchen or craft room. Deoderant – for me, not the hubby yet! Toothpaste – again for me…..I am the quinea pig for the ‘science experiments’ it seems…..
What’s ahead for 2012? Future posts to include recipes and/or links to the above ~smile~! It has been one year since I began my blog and decided I would review my journey to see how it has progressed. Last year my goal was to simplify my life and I know this has happened. I have never felt more content and fulfilled as I feel right now. No, life hasn’t gotten easier – our budget strings are pulled so tight they are ready to break, but I still feel more relaxed and ‘almost’ stress free. It has been a challenging year and fun at the same time. At least fun for me. I love learning new things, trying new things, and creating. One year ago I decided that to begin this ‘Simply Basic’ life I would: Make a Plan, Reduce Clutter, Cook From Scratch, Ditch the Disposables. I ‘plan’ all the time. I don’t have a written plan, but my mental plan of where I wanted to go changed direction a bit and has been very enlightening. Reducing the clutter has evolved on it’s own. When you don’t shop or buy ‘stuff’ the clutter seems to go away! I did clean out closets and drawers (both kitchen and bath) and donated a lot of unused ‘stuff’. For the items I couldn’t part with but rarely used I put in a box and have decided that if I don’t use any of the things in the box within 6 months they would get donated also. So far I have only gotten into the kitchen box ONCE so I see the rest of the box going away soon! Cooking from scratch has evolved a bit. Instead of last year’s plan to make ‘ready made mixes’, I have embraced the “Real Food” way of food preparation. It still is cooking from scratch, but on a different level. This past year I have learned that Kombucha and Kefir (both milk and water) are so delicious and a major health food, along with fermenting vegetables: cabbage into sauerkraut, beet kvass, salsa, gingered carrots. The kefir and vegetables provide probiotic, healthy bacterias that are good for our gut and liver. I have learned about healthy fats – coconut oil, lard, butter – and how good they are for us (and NO they DO NOT raise your cholesterol). I began rendering my own lard from grass-fed pork. I successfully started and grow my own sourdough starter and have made many successful things with the sourdough: english muffins, tortillas, pancakes. I have played with making our own cheese, but currently the cost of the raw milk doesn’t make this an option right now. I really want to raise a couple of goats. This way we could have our milk (I already have the eggs), so why not? The list could go on, but these are the highlights. My husband says our kitchen is like a science experiment. You never know what will be growing or brewing at any given moment. Ditch the Disposables has been pretty easy. I rarely use paper towels, but just can’t totally eliminate them, but one roll lasts for months now and most get thrown into the compost bin and not the trash. We use cloth napkins and lots of dish towels, but they are simple to wash so they aren’t a big deal. 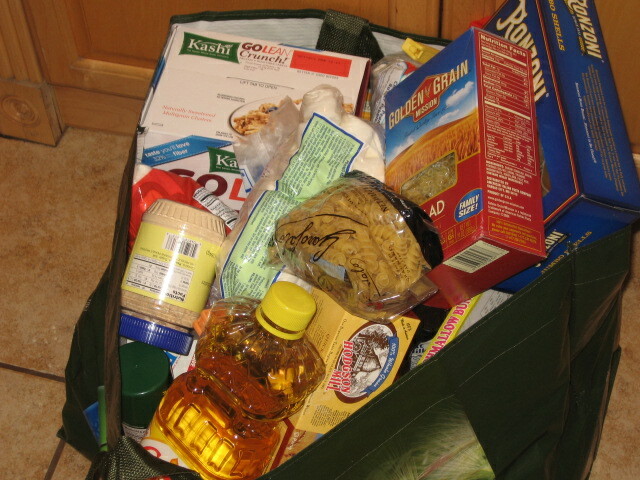 I still use plastic, zipper type bags but I wash and reuse them several times before they go to the recycling. I have been making my own household cleaners, shampoo, deodorant, and most recently soap, so this has eliminated unnecessary packaging waste. The homemade, personal care items have been really fun to make and I am so pleased with the results. I will post about these items another time. So, all in all, I have come a long way. The journey isn’t over, it has just begun. Oh yes, the final item on the list from last year, Stop Procrastinating…..this is still a work in progress ; ) . Am I Gluten Sensitive? Maybe…..
Was I feeling sick? NO. Just un-well, if this is a word. Just how do you describe not feeling good but not feeling ill. This best describes how I have felt for the past couple of years. I just figured “I am getting old” or blaming menopause due the hysterectomy I had a couple of years ago were the reasons I didn’t feel right. I ached so horribly bad in my hands, knees, and feet that I lived on pain relievers. I went to see my doctor and was diagnosed with arthritis in my hands. I went to see a naturopath and she did give me some advice regarding my aching pain – stop eating russet potatoes and tomatoes! Well, I did eliminate these two food items from my diet and I had some relief most days. I know these do cause me pain because when I have eaten them, I get that oh so familiar aching back. I love potatoes – prepared any way – mashed, baked, fried, salad, etc. I also use a ton of tomato sauce, paste, stewed, diced, fresh or canned in all my cooking, so this poses a few issues and most of the time I choose to eat them and deal with the pain later. Then came more research and I stumbled across the issue of Gluten Sensitivity and it’s related symptoms. I found several different websites that listed symptoms of gluten sensitivity and I have many of the classic symptoms. Now, mind you, in addition to my love of potatoes, BREAD was my first most favorite food item. I would eat toast almost every day, sandwiches for lunch, french bread with my tomato based pasta sauce and PASTA! Gluten, gluten and more gluten – every day! Maybe it wasn’t just the potatoes and tomatoes after all….. I have been eliminating gluten containing foods from my diet. I cook brown rice pastas and am making sourdough bread items (souring the dough helps inactivate the gluten in the flour). I am able to eat Yukon Gold and Red potatoes with no issues. When I do eat russet type potatoes I can feel it, so I try to avoid them as much as possible. I feel so much better now. So, am I Gluten Sensitive? Quite likely. The following is a list of symptoms I found and wanted to share – do you suffer from any of the following? Something to consider…..
Nongastrointestinal symptoms: Interestingly, although gluten sensitivity and celiac disease affect the gut, most people’s symptoms are not gastrointestinal in nature. This partial list includes just some of the more than 250 symptoms not centered in the digestive tract. It’s been way too long since I posted anything. It is not for lack of anything to say or lack of anything happening on the old home front, that’s for sure. There has been a lot going on, so today I am just posting my random thoughts for Thursday…. The Garden – it is doing quite well actually. We have enjoyed lettuce, chard, beets, broccoli, cauliflower, green beans, kohlrabi, new potatoes, artichokes, cherries and cabbage so far this season, all from our own backyard. I have nearly 7 lbs of beets to can and I just picked our first tomato (!) with tons more just waiting to ripen. I can’t wait for the romas to make salsa and the others to can for use this winter. I am now getting ready to plant a fall crop of beets and lettuce and in a few weeks I will plant garlic. Preserving – so far this summer I have picked and froze strawberries, blueberries, and marionberries. I made some strawberry jam and mashed and froze the marionberries to make jam at a later date. 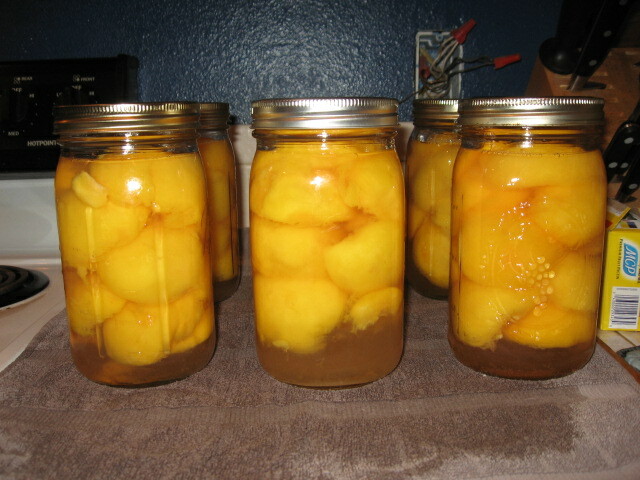 I picked 52 lbs of peaches this week and just finished canning 8 qts today. 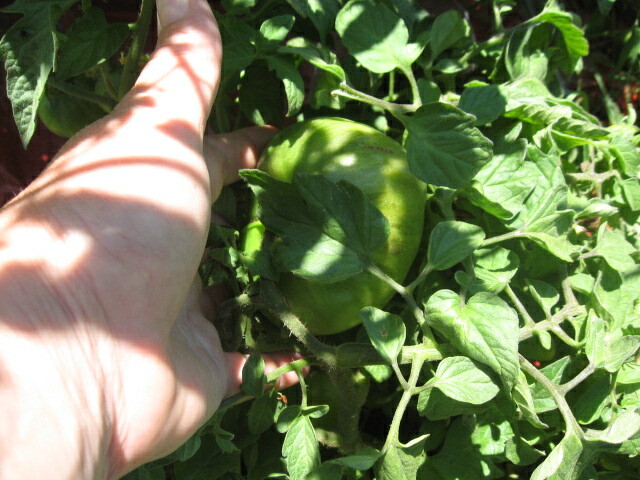 They are not quite ripe enough, so I am going to can more in the next day or so. I am looking forward to picking pears and apples in the next couple of weeks. 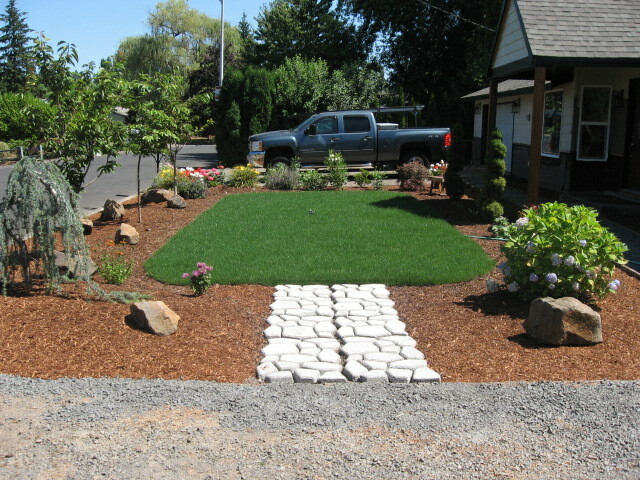 Yard Work – We are in the middle of a complete remodel / addition to our house and the front yard has truly suffered from neglect so we took a break from inside work and focused on redoing the front landscaping. I still need to add a few more shrubs and plant bulbs this fall for spring flowers, but the heavy work is done for now. These are just a few of the things going on here. I started making my own multi-purpose spray cleaner several months ago. You may ask: Why make your own household cleaner? It’s only pennies to make compared to store bought cleaners, really easy to make, no toxic chemicals, and you don’t have to buy more plastic to add to the landfills since you can reuse plastic spray bottles making sure to label them correctly. Also, I can make the spray any scent I am in the mood for. I use essential oils for their antibacterial properties and because they smell nice too. I’ve used lavender, lemongrass, peppermint and red thyme. I like the lemongrass or peppermint essential oil for my kitchen spray and lavender or red thyme for my bathroom spray. I have tried other so-called ‘green cleaners’ from the store but I don’t like the smell and they cost anywhere from 25-45 cents per ounce. This homemade cleaner works equally as well for a fraction of the cost. This homemade cleaner will run you anywhere from 1-3 cents per ounce. You can use this cleaner on most surfaces. I wouldn’t recommend it on marble however, since the vinegar may harm the finish. I have used it on glass and my hardwood floors with excellent results. It also works great for cleaning my grout on my kitchen counters and shower walls since the hydrogen peroxide slightly bleaches the grout (I have colored grout in my kitchen and white grout in my bathroom and it cleans without affecting the colors). 1. Add water, vinegar and hydrogen peroxide into a spray bottle. 2. Add the castille soap and drops of essential oil, cap, and shake the bottle. Not knowing what the second day would bring turned out to be not so bad. It was directed to be a day to do some grocery shopping and at first I was a bit concerned since I will not be able to do this until Thursday. However, I had most of the real food items already in my kitchen so I feel much more confident that I am on the right track. Maybe this will be easier than I thought….. This morning I received my first email instruction for the beginning of the 28 Day Real Food Challenge. I felt pretty confident with this step – I keep healthy foods, or so I thought. Well it wasn’t too bad, but I did have to remove more than I thought was in there. 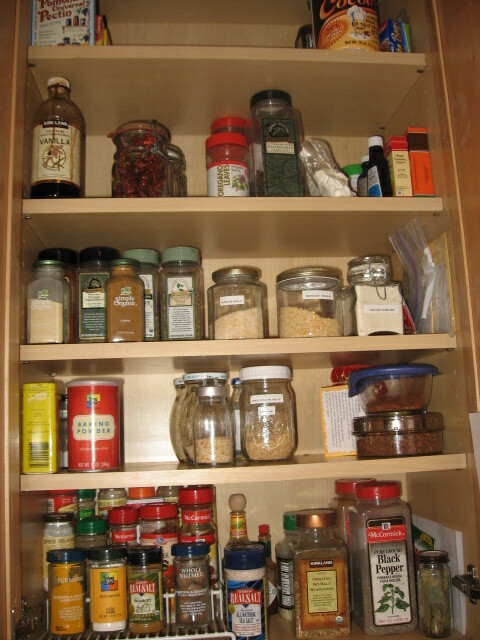 It actually was a good time to clean out the cupboards since some of my shelves are so high up that I can’t see what’s on them anyway. Well needless to say, I found some old stuff that was outdated. Marshmellows – these were there actually because I used them in a craft project before Christmas. Jar of Marshmellow Creme – I think this has been in there going on 2 years. Think it was for fudge or something….obviously didn’t need this one! 3 boxes pasta – one box was whole wheat noodles (and I thought I was doing so good…) looks like the macaroni will make great kid crafts! 1 jar ‘powdered’ peanut butter – this from when I was on a “healthy” weight loss program! 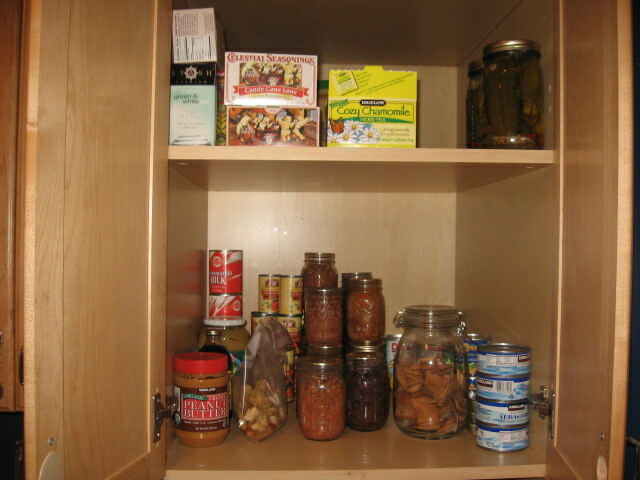 Even though it looks like I had a lot of BAD stuff in there, I actually have much more ‘legal’ foods. 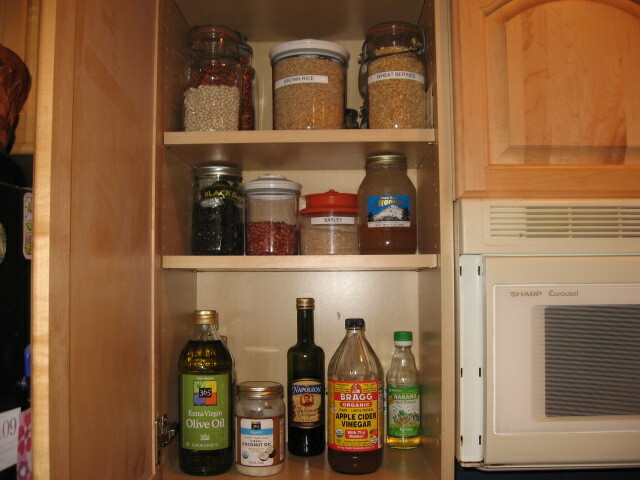 I have the healthy oils (olive oil, coconut oil), raw cider vinegar, dried beans, brown rice, wheat berries, barley, raw honey, real maple syrup, tons of spices and sea salt, crispy nuts (pecans and almonds), homemade sourdough crackers, assorted teas, whole wheat flour, oats, organic corn meal. As for the cream of chemical soup, I have been making my own version for a while now (this was just a straggler from the past) and it really tastes so much better and isn’t that much harder than opening a can. I looked through the refrigerator (no picture because it really doesn’t look very appealing) and really didn’t find anything to move out. No skim or lowfat dairy lives here. I do not have ‘raw’ milk currently (cost prohibitive at the moment) but the dairy I do have is whole, organic milks and plain yogurt, real butter both regular and some grass fed, some Kombucha and miscellaneous vegetables. I have a few ‘husband’ friendly items that I will not be removing. He is supportive of the real food goals to a point, but it will take a bit more time with him. 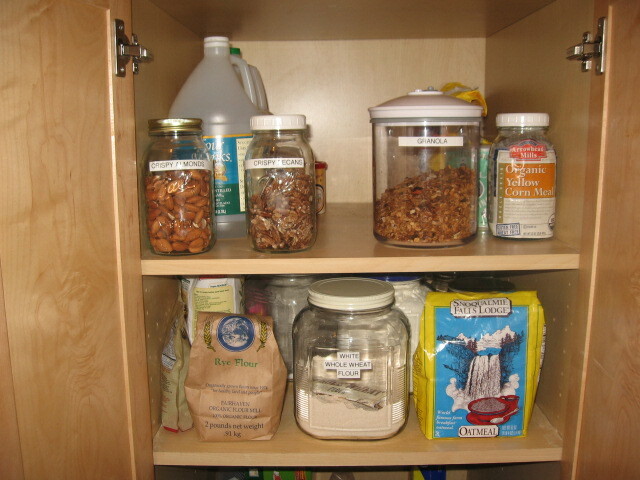 I feel that if the majority of our meals and snacks are made healthy that a few less than ideal items will just have to have a place here as well. The freezer has some grass-fed hamburger amd a few chicken breasts. Looking forward to Day #2.